When Cathy Benecke and Dana Effron started the Miles of Hope Breast Cancer Foundation eleven and a half years ago, they decided to provide services and outreach to people affected by breast cancer within the 8 counties of the Hudson Valley which did not exist: financial help for people in treatment; ancillary therapies like massage, acupuncture, exercise and yoga; a peer to peer hotline for people diagnosed with breast cancer who have questions; and a scholarship program for college-bound high school seniors whose lives have been touched by this disease. Little did they know that the Foundation would grow to give away over $1.5 million dollars for these programs for their neighbors, friends and colleagues affected by breast cancer. Thousands of people have had their burden lifted by Miles of Hope and thousands have given back in volunteer time, donations and sponsorships of events. Every year the Miles of Hope Breast Cancer Foundation awards scholarships to local high school seniors in the eight counties of the Hudson Valley whose lives have been affected by breast cancer. All of these students have outstanding academic records and extracurricular activities but what sets them apart is the connection to breast cancer in their young lives. The scholarship applicant is required to write an essay explaining how breast cancer has affected them. Most write poignant and touching compositions about a parent or other relative, but some talk of volunteering for cancer organizations or watching a friend go through the trauma of a breast cancer diagnosis in their family. The essays are very moving and show a level of maturity well beyond the typical 17 year old. Two funds had been established since the first scholarships were awarded eleven years ago. The Betty (Benecke) Howard Scholarship Fund was established for college-bound high school seniors planning to pursue a career in the healthcare field. “Our family has been devastated by cancer,” explained Miles of Hope Co-Founder Cathy Benecke Varunok. 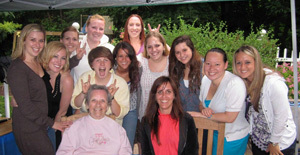 “My sister, Betty, died after a breast cancer diagnosis when she was in her 30s.” In 2015, Julianna Arico from Arlington High School won the Betty Howard Scholarship awarding her $2000 toward her continuing education. Mrs. Varunok’s family established a second scholarship fund after her brother, Michael, passed away in 2014. “We want to remember Michael by establishing this scholarship fund in his name to help students with a financial contribution to their education,” she explained. This year, Daniel Rannekleiv from Somers High School won the Michael Benecke Scholarship, awarding him $2000 to attend either Penn State or U Mass. The Benecke Varunok family has now established a third scholarship fund at Miles of Hope, the Betty Benecke Scholarship Fund for a college-bound high school senior whose life has been affected by breast cancer, pursuing a career in the arts. Scholarship recipients throughout the years have finished their education and become doctors, nurses, teachers, business people and parents. Each one helped along by an important monetary contribution but also by the support and encouragement of Miles of Hope.